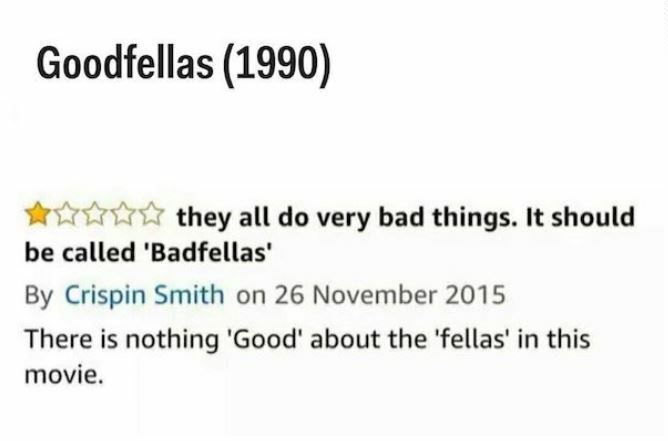 We have all watched a movie and left disappointed at some point in our lives. 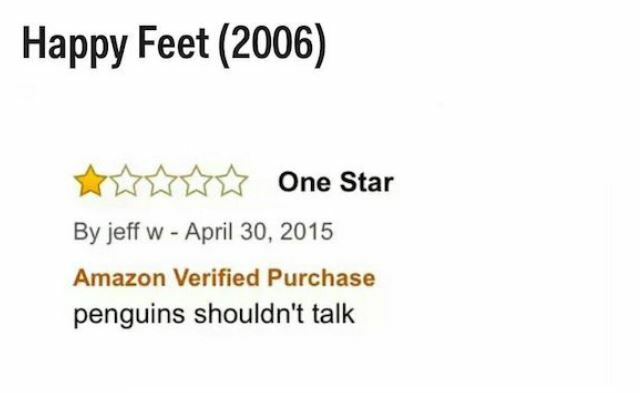 However, have you ever been so disappointed that you leave a one-star Amazon review? Neither. 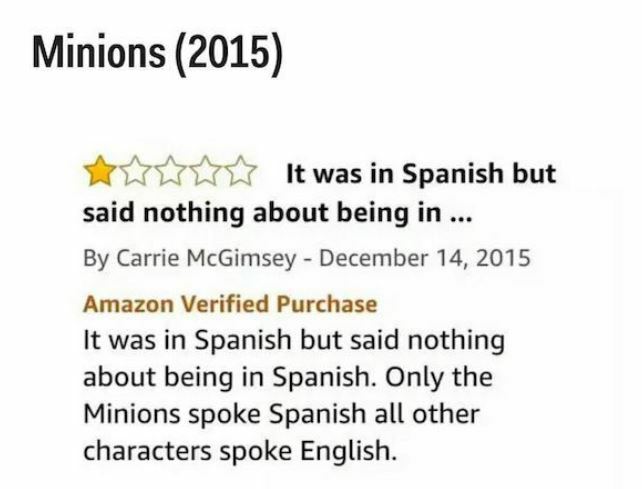 There are people out there that really are upset enough to write one-star reviews on Amazon and these are CLASSIC. 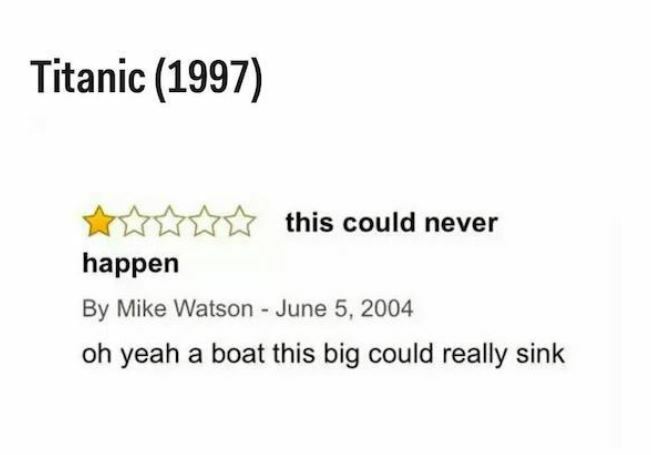 Whether its Jaws being totally unrealistic or too many monsters in Monsters Inc. these reviewers really do have a problem with everything. 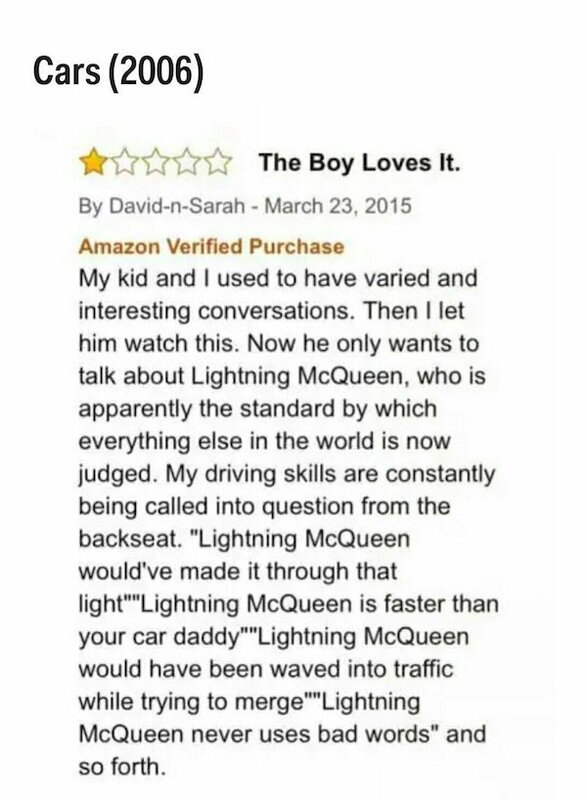 Having said this, their reviews make for a highly entertaining read and we hope that they aren’t all serious…right? 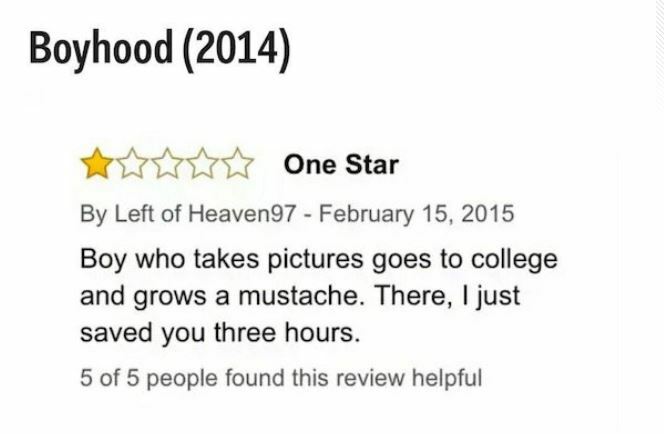 This is a true observation to be fair. 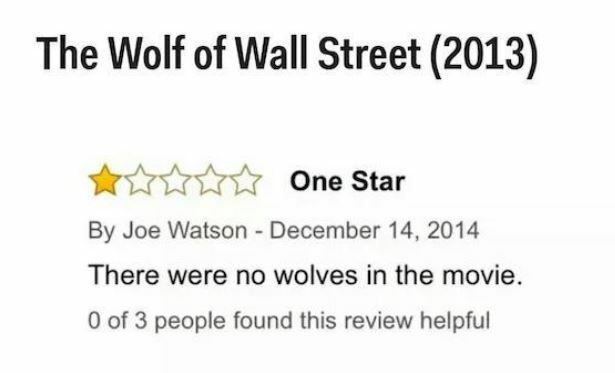 However, we can’t say we ever remember thinking halfway through the film, where ARE those pesky wolves then? False advertising! This guy completely ignored the fact that this film was about the joys and pitfalls of growing up and instead straight up SAVAGED it. At least he THINKS he’s doing us a favour and saving us three hours. 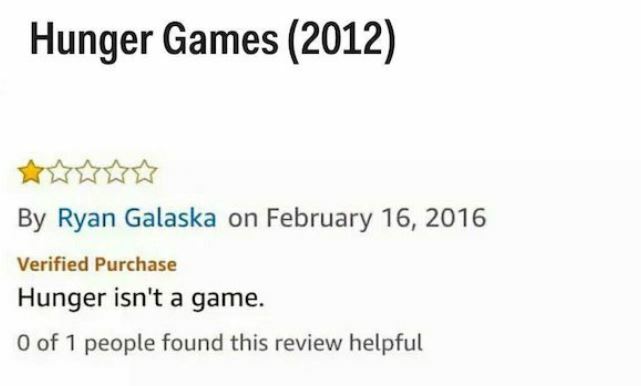 However, it took us two seconds to read his ridiculous review and we aren’t ever getting THAT back. 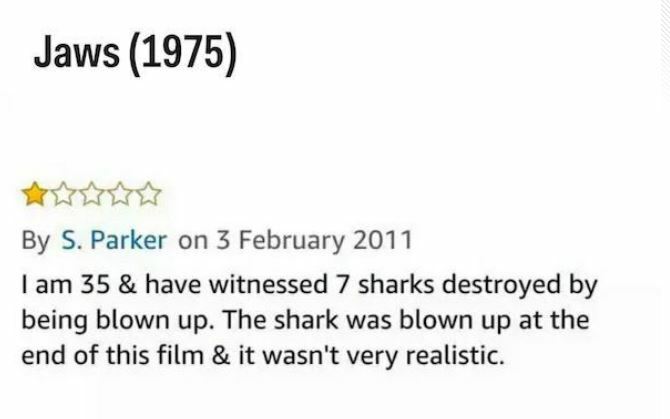 This reviewer has an issue with sharks being blown up. Who has an issue with that?! But I guess making a film as realistic as possible is more important than making a film entertaining. Fair enough. Honestly, the title of this review is ‘propaganda at it’s best’ and I must admit, that made me chuckle. 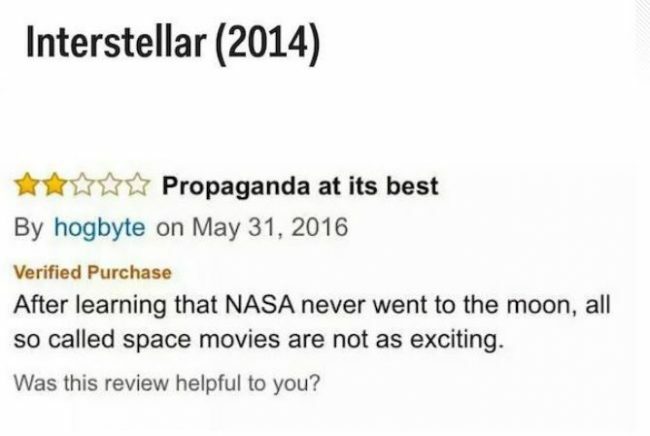 We are pretty sure that Interstellar is not the work of the government pushing some regime on us and NASA did go to the moon so…don’t insult Interstellar again, it’s one of my favourites. 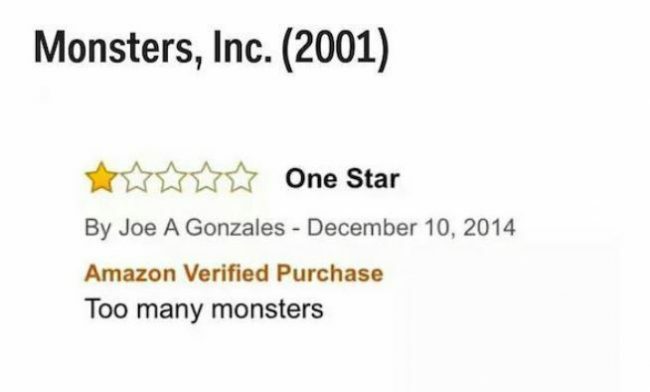 We must admit, Joe is the king of observations, yes, there are a lot of monsters in the film called Monsters Inc. 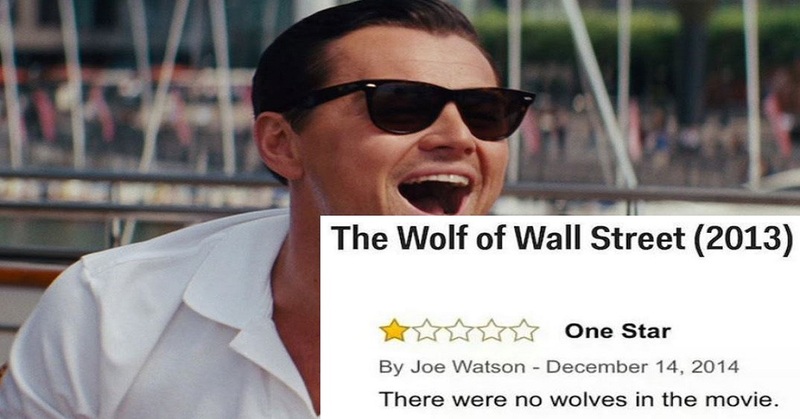 However, there were too many for Joe. There’s just no pleasing you, Joe. 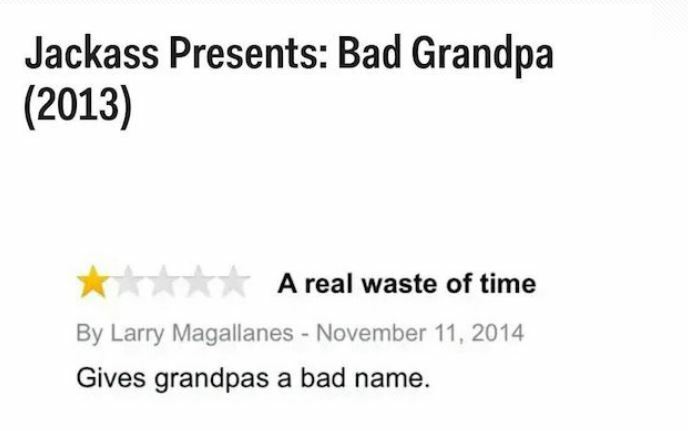 We get the feeling that Larry must be a Grandpa as he seems very upset about this film giving Grandpas a bad name. 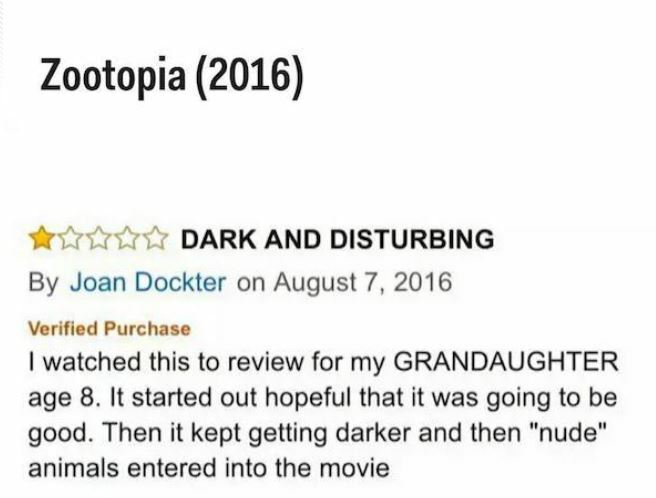 It’s okay Larry, we still love Grandpas even after watching this movie! Okay, we have to agree on this one. The missions are never impossible in a movie that claims that they are. 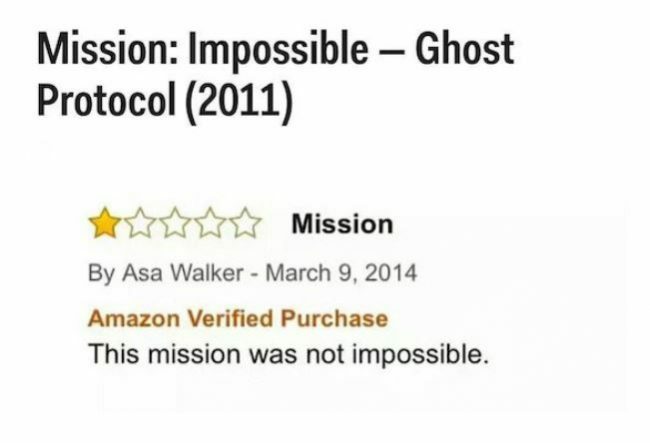 Having said this, if every mission really was impossible, what would be the point of the movies? Nothing’s impossible, kids! 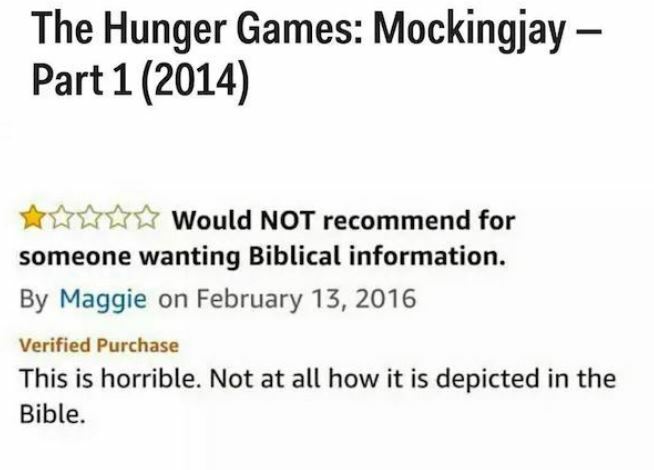 We are sad that this reviewer’s cat died. 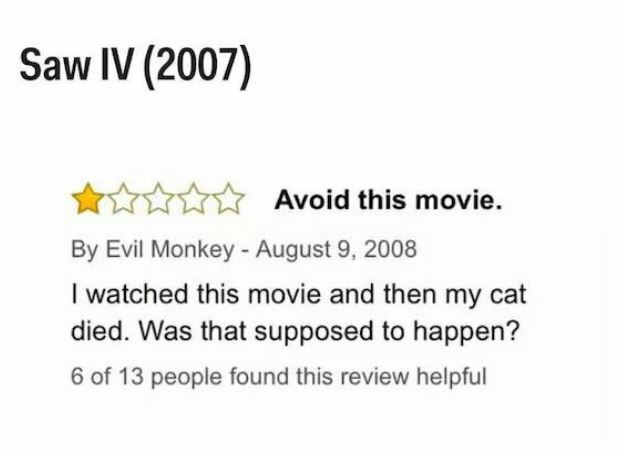 However, we are 100% certain that watching Saw will not cause your pets to die. 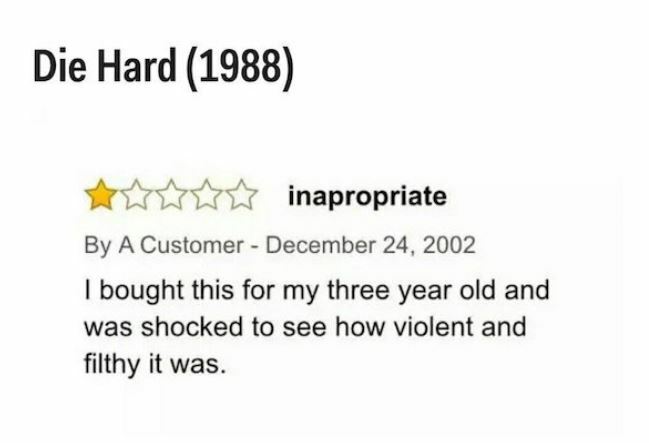 Yeah…Die Hard is definitely not suitable for a three-year-old. Totally agree…false advertising at its finest. Ain’t nothing good about these fellas! 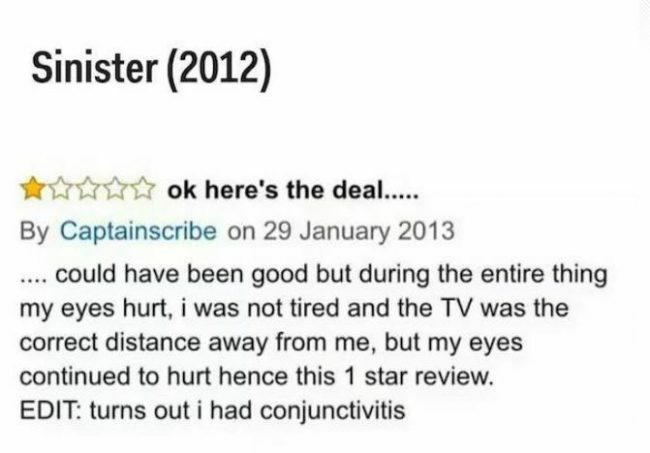 This movie was so bad it hurt this viewer’s EYES. Thankfully, it ended up being conjunctivitis and nothing to do with the movie after all…the one-star review still stands though! This one cracked us up. To be honest, I was the same, I originally thought it was for kids and I was like the name is a little odd for a kid’s movie…then I watched the trailer. Oopsie! A film that is based on a real-life event…UNREALISTIC! This has got to be a troll. 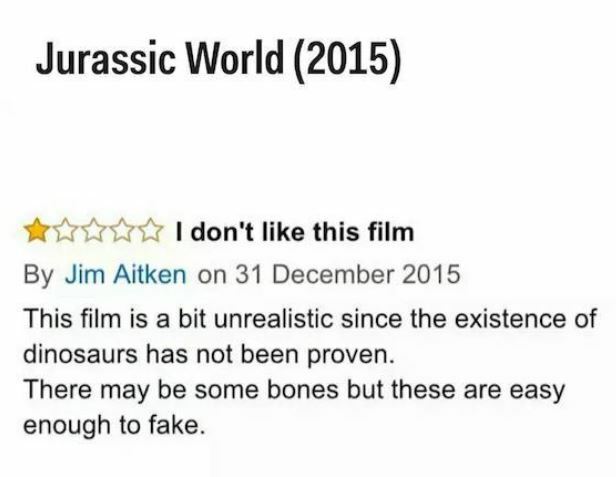 Okay, Dinosaurs did exist, sorry to break it to you! Also, why is everyone so bothered about movies being realistic?! We don’t see people getting bothered by Avatar because that TOTALLY happened.